TheGunBlog.ca — The Canadian government’s Bill C-71 heads to the Senate for review after having passed its third and final reading in the House of Commons today. The proposed law could take effect this year as part of a series of measures by the ruling Liberal Party to curtail the private ownership of firearms. The Liberals presented Bill C-71 in March to add obstacles on police-vetted gun owners who buy, sell or transport firearms, or simply keep the ones they have. If passed by the Senate, which is likely, the bill would prohibit rifles owned by more than 10,000 men and women and make it easier to ban other guns. A total of 185 members of parliament stood in favour of Bill C-71 and 79 stood against, according to the tally by the Speaker of the House this evening in Ottawa. If passed, the bill will add new constraints on millions of Canadian men, women and youth who hunt for food, use firearms for protection, enjoy plinking, or shoot in matches. Nine Team Canada shooters aged 20 to 72 competed in a world championship in South Korea this month for spots in the 2020 Olympics. Under Bill C-71, they will need special police permission to take a pistol from home to the gunsmith or the airport, or risk prison. A separate police authorization would be needed to pick up a pistol from the gunsmith and take it to the airport en route to a match. A third police authorization would be required to take a pistol from a gun store to a gunsmith for customization. If a pistol needs tuning after a range session, it would be a criminal offence to take it directly to the gunsmith without a fourth specific police permission. Police offices that review the permission requests are closed evenings and weekends. They will have full discretion to refuse the requests. The Canadian Shooting Sports Association nicknamed Bill C-71 “The Federal Firearm Owners Harassment Act.” All gun-rights, gun-industry and major hunting associations oppose it. At the Senate it will undergo a similar process of debate as it received in the House. This bill affects all firearms users, whether you are a hunter, trapper or recreational shooter. The Liberals outlined many of the elements of Bill C-71 in the 2015 election campaign that won them a majority of seats in parliament. Anyone who didn’t vote Conservative in that election contributed to the Liberal victory and their continued assault on shooters. In 1995, they made it a crime for a husband to give his spouse a gun unless both had permission from the federal police. They also initiated the confiscation of hundreds of thousands of handguns and rifles from licensed owners after they die. In 2004, they voted new restrictions on gun imports that are now scheduled to take effect Dec. 1. A major public-relations firm that advises the government said in March that the Liberals could win votes by further squeezing firearm users. That would mean the seizure of more than 1 million pistols and revolvers in the hands of Olympic athletes and other licensed owners, since all other firearms are banned already. It could also mean the confiscation of the SKS, developed for the Soviet military and now the most-popular semi-auto centre-fire rifle in Canada. All MPs present from the Liberal Party, New Democratic Party, Bloc Quebecois and Green Party stood in favour of Bill C-71 today when the voting began at 6:45 p.m. in Ottawa. T.J. Harvey and some other rural MPs were absent, in some cases to avoid risking their seats by supporting their party and voting for an unpopular law. Harvey was replaced as leader of the Liberal rural caucus in April after sharing concerns about Bill C-71. All MPs present from the Conservative Party stood against the bill, including Andrew Scheer, Glen Motz and Rachael Harder, who led opposition to the proposed law. 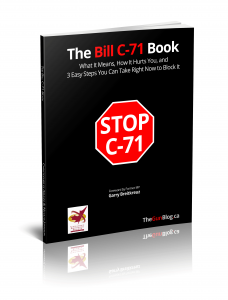 Harder sponsored a House of Commons online petition to protest Bill C-71. It’s the second-most-signed e-petition on record. Maxime Bernier, the MP who quit the Conservatives a month ago to set up his own party, was absent from today’s vote. The last time he mentioned Bill C-71 on Twitter was six months ago. Scheer, the leader of the Conservatives, suggested last week Bill C-71 could become law by Christmas. He pledged to repeal and replace it if elected prime minister. He also joined police leaders, provincial premiers and shooters across the country in rejecting a handgun ban aimed at licensed owners. Update 25 Sept.: Adds OFAH comment. Update 26 Sept: Adds Bernier response.